The Bonnaroo Music & Arts Festival, especially in its early years, was in large part all about the unknown collaborations and Superjams that were to unfold once you crossed the Centeroo arch threshold into the venue area of the magical 700-acre Tennessee farm. In recent years, the Superjams have been brought back in full force and this year’s festival features “The Soul Superjam with Jim James, Daryl Hall, Zigaboo Modeliste and the Preservation Hall Jazz Band” as well “Ed Helms’ Bluegrass Situation Superjam with Special Guests” – two special, one-off live music events that aren’t likely to repeat elsewhere this summer. In addition to those, you can count on a bevy of surprise sit-ins throughout the fest – ’tis the nature of the beastly mega fest. The latest release on the Bonnaroo365 channel (see below) briefly highlights some of the bigger collaborations to go down in recent years at Roo, including The Boss and Phish, MMJ and Kirk Hammett of Metallica, John Paul Jones of Led Zeppelin and Gov’t Mule and many more. Check out the clip below and read the smattering of brief recollections from my memory bank of sit-ins and superjams at the nine Bonnaroos (2003-11) I was lucky enough to witness. Also, who can forget the following night when Trey Anastasio, Mike Gordon, Marco Benevento and Joe Russo (G.R.A.B.) showed up as the mystery Superjam band and, as an added kicker, brought out Phil Lesh for “Goin Down The Road Feeling Bad”?! Walking up to this set and seeing who it was is a sensation I’ll never forget and to see Lesh pop up later in the show was a big cherry on top. 2007: tool blew the gaskets off the main stage at their sea-changing headliner set in ’07 and notably invited Tom Morello of Rage Against The Machine for “Lateralus”. Lasers galore on What Stage that night. 2008: My Morning Jacket capped off a four-hour marathon set in the rain by bringing out a visibly intoxicated (it was 4 am at Bonnaroo so a big chunk of slack must be cut here) Zach Galifianakis to sing lead on a closing cover of Motley Crue’s “Home Sweet Home”. Also, as featured in the Roo official video above, Kirk Hammett of Metallica also joined the band to close set one with a blistering “One Big Holiday”. 2010: GWAR was joined by comedian Margaret Cho and the video below pretty much speaks for itself. 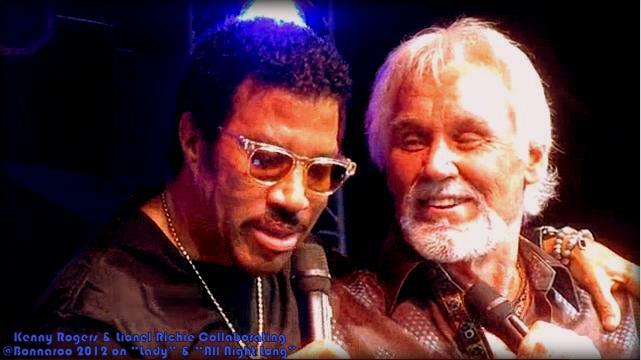 2012: Although I wasn’t able to make it, I tuned into a good bit of the webcast throughout the weekend and the surprise appearance of Lionel Richie (who was not appearing at the festival) for “Lady” and “All Night Long” during Kenny Rogers set was pretty special, even while viewing on a 17″ screen 2,500 miles away. Kenny would later make yet another appearance with Phish for “The Gambler” at their Sunday night main stage show. There is magic on that farm, that much is for certain. p.s. I wasn’t there (barely old enough to drive at the time) so for 2002 memories, we’d love to hear your standout sit-ins in the comments section below if you were at the inaugural festival.